I want to tell you about my chocolate company called Dad's "World Famous" Chocolate Bourbon Balls based on a recipe of my father's. Each one is hand made using only the freshest ingredients including Kentucky's finest 90 proof Straight Bourbon Whiskey, and dipped in smooth semi-sweet chocolate. 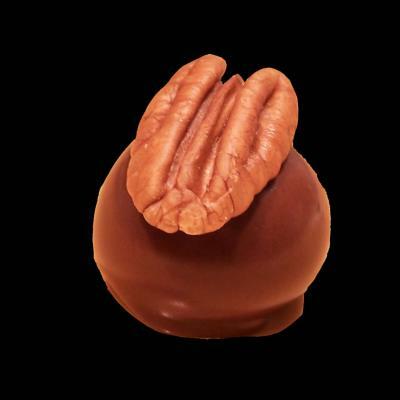 Then we top each one with a perfect pecan half and gently wrap it in foil. The Bourbon Ball has been a delicacy of my home state Kentucky since the mid-nineteenth century. It has evolved into many variations over the years and we believe that ours are the best due to my Dad's unique and delicious recipe, our commitment to quality, and dedication to the customer experience. Our Bourbon Balls are available in Gold Tins, which make great gifts for friends, family, colleagues and clients, as well as Favor Bags of 2, perfect for wedding and party favors. Our Bourbon Balls are also available individually to be served to party guests for any event. We ship nationwide via USPS Priority Mail and UPS 2nd Day Air in styrofoam lined boxes with frozen cold packs to ensure your order of Dad's "World Famous" Chocolate Bourbon Balls arrive ready for you to enjoy! I'm not a huge fan of whiskey or other liquor flavors, but I have to admit your chocolates do sound tempting. :-) Thanks for sharing your launch with the visitors here at Chocolate Candy Mall. I have a feeling you're going to cause more than a few mouths to water.